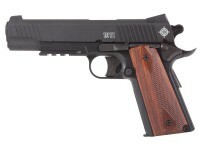 Since first rolling off the line, the 1911 pistol has been one of the most highly prized shooting platforms. 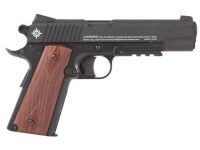 This granddaddy of modern pistols as it continues to be an inspiration for Crosman in giving customers a backyard 1911 shooting experience for pennies on the dollar. 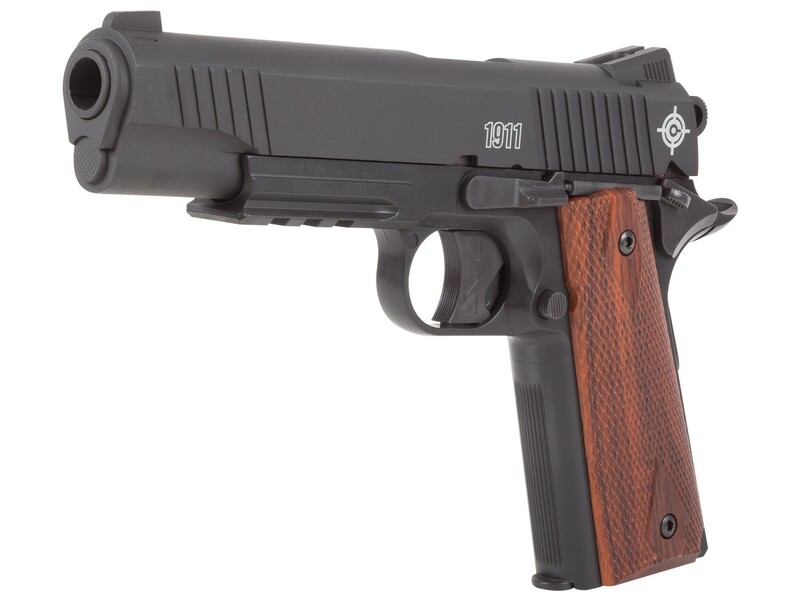 No stranger to the 1911, Crosman crafted its newest 1911 as a rapid-fire pellet plinker--the 1911 CO2 Pellet Pistol in classic matte black finish. With a single 12-gram CO2 and its dual head rotating loader, shooters can fire off two 6 shot rotary clips that can fire not only pellets but BBs at speeds up to 350 fps through its rifled barrel. To use the mag remove the dual rotary clip, load up your pellets, load your CO2, and reinsert the clip back into the magazine. 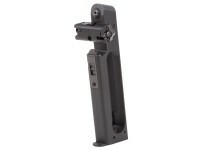 Shoot your 6rd mag, eject the cartridge, turn the clip holder 180 degrees, and shoot the last 6 rounds. 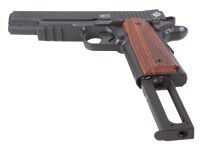 Each Crosman 1911 pistol’s body comes loaded with features that 1911 plinkers love, like a full-metal body, and finely checkered faux wood grips. Although the slide does not include a blowback feature, this only means that you can expect much longer shot strings and find yourself reaching for a new CO2 cartridge much less often. If you own a laser or flashlight, you can attach it to the Weaver accessory rail to add a new dimension to your shooting sessions or shoot with the fixed sights right out of the box. 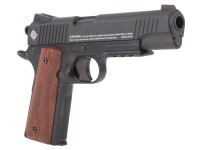 No replica airgun collection is complete without the venerable 1911! With the ability to shoot pellets from a 1911 platform, and an improved pellet magazine system, Crosman has delivered a plinker destined for greatness on the backyard range. Things I liked: Other than its initial outward appearance, nothing. Things I would have changed: The "slide" is fixed and completely non-functional. I knew it was not a blow-back, but the slide does not even move manually. The "hammer" is non functional and is not the actual hammer. I thought at least it might be cocked and fired single action but the visible part that represents the hammer is a limp impostor. The actual hammer is concealed. The "magazine release" is just half of what is needed to remove the magazine. After pressing it you must manually pull on the lip to get it to begin coming out. The "magazine" is also mis-named as it does not function as a magazine other than to resemble one. It is actually a double pellet loader that functions as a revolver. Both of these loaders has a different effect on trigger pull as they rotate during the pull so that the trigger feels different depending on which one is in place at the time. The controls with the exception of the magazine release button are all non-functional including the non-moving grip safety. The POA is not the POI. What others should know: Pass on this one. 99% of my reviews are positive but this product simply has no real purpose. 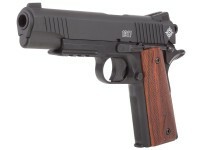 If you want a 1911 replica there are many that have the function, appearance and quality to meet that desire. This one has only a dim resemblance once in hand, and is nothing other than a revolver in function and that function is not very good. If you want a revolver you might as well get one that will please you with the appearance and function of a quality revolver. The shortcomings of this gun are not worth the additional investment of putting a laser sight on it to correct the Point Of Impact to agree with the Point Of Aim. It groups reasonably well despite the lack of a decent trigger pull but I have scores of pistols that I enjoy shooting; this one is a labor and chore to shoot. There is no enjoyment in that. Despite my reservation to do so, I put an inexpensive laser on this pistol to correct the POA/POI conflict and got a very surprising result. I forget who said, "Only accurate guns are interesting", but this gun became very interesting with the laser installed. First, it shot some pellets so precisely and consistently to the Point of Aim that I could call my shots. It hit where the laser dot was with amazing regularity. See my other comment for the details. Amendment to initial rating: 3 stars overall, Accuracy 5 stars. With a laser installed I got the following groups with different pellets, all of which shot to same zero: (6 yards, standing unsupported best 5 of 6 shots) .514", .620", .489", .532",.707",.403", .705", .405", .481", .505". Two other pellets were so accurate I fired 3 groups with each: 7.4 gr. 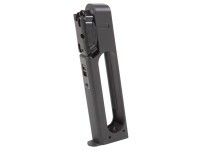 Crosman Competition WC - Avg .381"; smallest - .340". 7.3 gr. JSB Match Diablo Exact RS Dome - Avg - .315"; smallest - .204". Pellets must fit readily into the chambers of the loader or they will create drag during rotation of the cylinder which is greatly amplified upon the feel of the trigger with some reluctant pellets even preventing trigger movement. Every pellet that seated easily resulted in a consistent trigger pull which made the above accuracy possible and there was a lot of enjoyment in that! This is as good as my off-hand accuracy with my target pistols, although they can deliver it with open sights. Get a laser! Is this the same as the Hatsan 1911 rebranded? Do the Mags interchange?